St Michael’s church, Michaelston super Ely is an ancient structure originating in the 12th or 13th century but was altered substantially in the 1860s by David Vaughan and the interior was rearranged by F. R. Kempson in 1908. A full history of the church has been presented by Vile.1 The church has been de-consecrated and is currently in the process of being converted to a domestic dwelling. 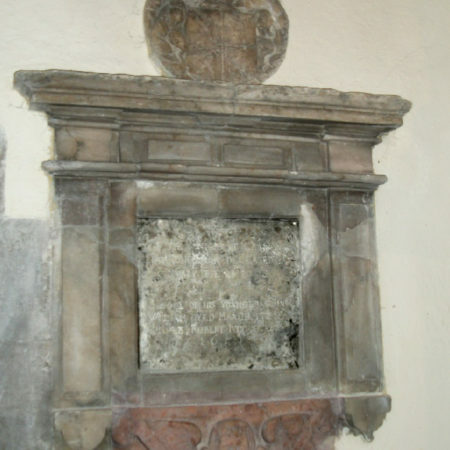 On the east wall of the tiny vestry there is a wall monument comprising an inscribed slate plaque in a frame of Penarth alabaster with a shield apparently depicting “Gwrgan impaling Bassett” above and a winged angel below. 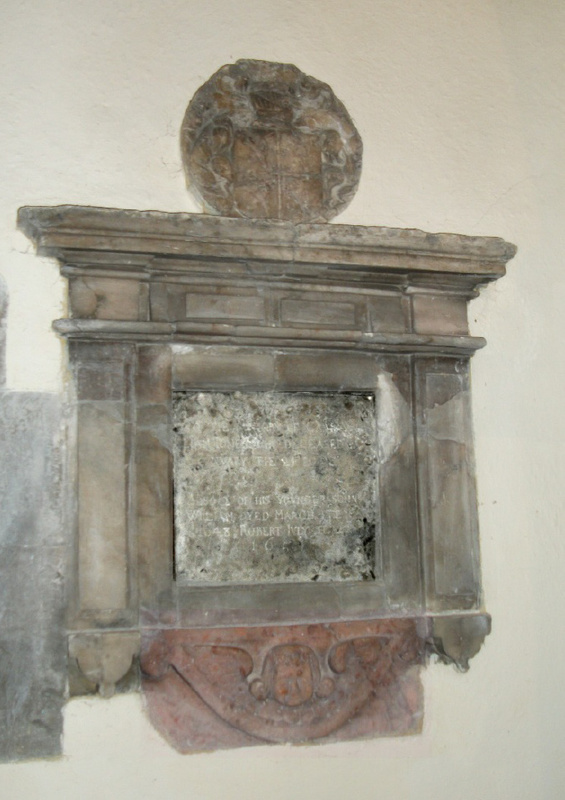 The lower section is in Latin and commemorates the death of John aged 107 on 12 February 1630 and his son Richard aged 77 on 21 April 1658. The point (disputed) was not virtue [?virtuous]. “of our part” could be “in our view” and the second line could be “The point in dispute between was not virtuous”. 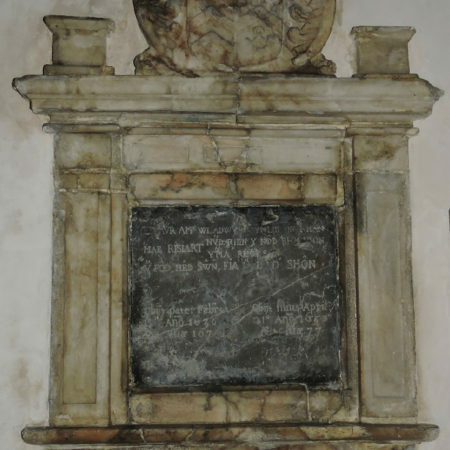 After much research, his elaborate explanation, which stretched to several pages, concludes that Richard, at the age of 77, was hastened to an early grave having been wrongfully dispossessed of his property by Cromwellian forces under the command of one Col. Philip Jones. and concluded that there is no cryptic meaning hidden in the poem. “In sorrowful memory of patriotic pursuers (of the foe). On our side is Richard II now with God (by Rhyn). The creirwry Oath (Nod) is a covenant between us and his spirit. 1 W. B. Vile. 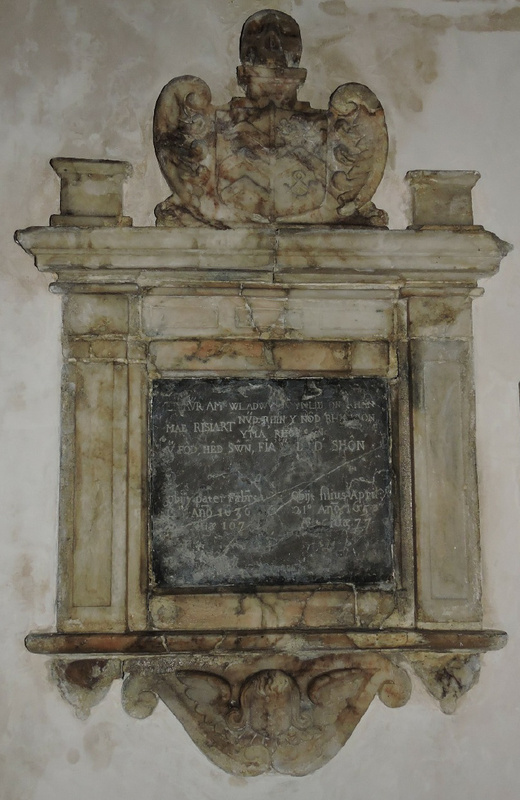 A History and Description of the Parish Church of St Michael Michaelston super Ely. Revised edition 1981 (Glamorgan Archives P44 CW/6/1). 2 David Jones. 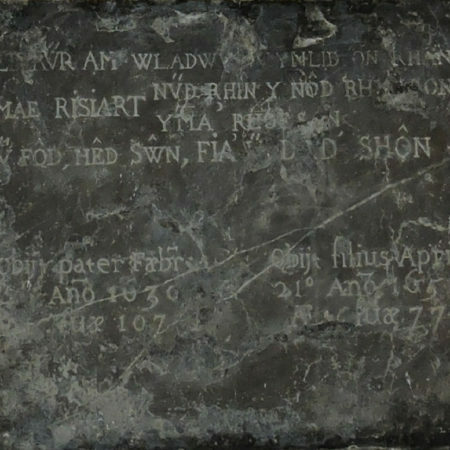 On a Seventeenth Century Welsh Inscription at Michaelston super Ely Glamorganshire. Archaeologia Cambrensis Fifth Series Vol VI No. XXII July 1889 pp 198-213. 3 Evening Express 25 Feb 1897. 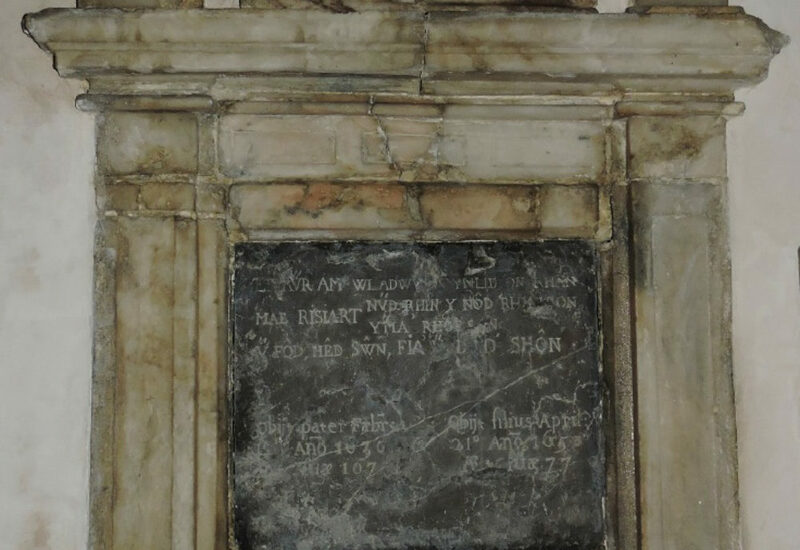 Curious Inscription in a Welsh Church. 4 Evening Express 8 August 1896. Interesting Discoveries. 5 Michael Statham 2016. Penarth Alabaster. 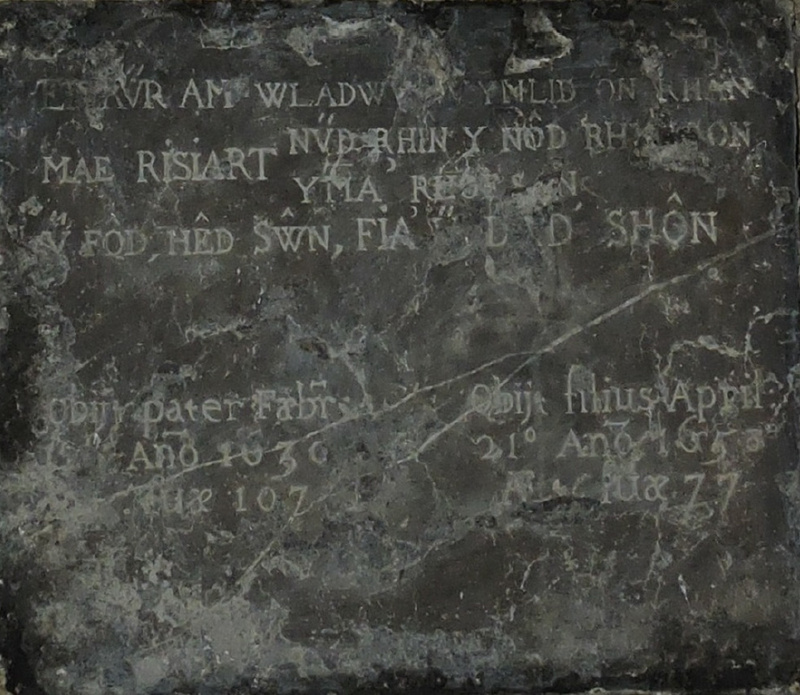 Awaiting publication on the website of the Welsh Stone Forum. Michael Statham 2016. In Search of Penarth Alabaster. Awaiting publication in The Ecclesiologist.